Garageband is Apple’s Digital Audio Workstation that is bundled with iLife, and with any newly purchased Mac computer with Mac OS X on it. Many praise Garageband as an excellent entry-level Audio Processing application but there is no denying that it isn’t without its shortcomings. As Garageband is basically a ‘free’ application for new Mac users it cannot be expected to replace Pro Tools or other professional Audio Workstations. Garageband does also not aim to be this but merely a step into the audio editing direction, with Apple offering a more professional experience with Logic Express, and ultimately, Logic Studio. Talking of which, the Logic apps are designed to perfectly integrate with Garageband to fill some of the voids. One of the voids that Garageband leaves comes in the form of exporting MIDI files. While Garageband is perfectly capable of importing MIDI files, it cannot but default export your MIDI creations. However, both Logic Express and Studio can, and Garageband can export MIDI’s into either of them. According to Apple this is the most suitable and only workaround, albeit a costly one. Select the loop that you want to export. Select Edit in the top bar and select ‘Add To Loop Library’. Export your loop, which will be saved as .cst, .aif and .mid. Use the .mid is your MIDI file, which essentially is now exported. The above mentioned should put you right on track but can be a bit tedious and is not ideal. 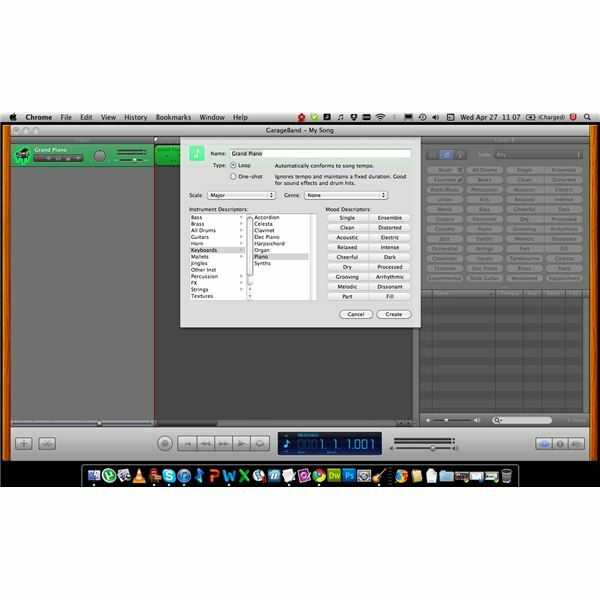 However, without any native support for MIDI export built in, this may well be your best option. Another option is to use a tool called ‘midiO’. MidiO is designed to function as an Audio Unit plugin allowing MIDI output, but only into another MIDI enabled application. It is up to this application to export the MIDI to file. Double Click the track you want to export and select the details triangle in the lower left part of the pop-up screen. In the generator menu, select ‘Midi Out’. Click on the details triangle again and choose ‘midiO’ in the generator menu. Set the parameters for midiO by clicking on the pencil icon, right of the generator menu. Select your MIDI destination in this menu. This method is perhaps even more tedious than the ‘loop-method’ explained earlier. However, the biggest advantage of using midiO as your MIDI exporter is that you retain the freedom to select your own post-processing software, meaning you do not have to stick with Logic. Whatever your choice of use is, it will be obvious that Garageband should not be your number one for MIDI creation. For the occasional MIDI user, however, this guide should put you on the right track. If you found another method for exporting MIDI in Garageband, feel free to post it in the comment section!